The children's strikes of 1911, as Dave Marson shows in this pamphlet, were part of the huge upheaval of labour in the long, hot summer of 1911. The industrial unrest has often been written about: the school strikes are Dave Marson's own discovery. He came upon them by accident when researching into the history of his own people, the Hull dockers. He has followed the strike movement all over the country, and has set them in both a school and a community context. The school situation which he describes has by no means disappeared: nor have the difficulties of organising resistance. The writer is a working docker, who was a student at Ruskin in 1970-2. I came upon the children's strikes of 1911 by accident. I was researching into the Hull Dock Strike of 1911, and reading through the Hull newspapers of that year when I noticed a small paragraph relating to a strike of Hull school children which took place in September 1911. It seemed no more than a curiosity, an illustration of the extent of the industrial unrest taking place at that time. What struck me first was the story about a policeman having to mount his bicycle and charging at the youthful strikers who had formed a picket line outside their school. The mere sight of a blue uniform was enough to frighten me and my school friends. What set me looking further into things was one line in the report which said that the Hull boys were following the example of children in the West Riding of Yorkshire. Then looking through another Hull newspaper I discovered a front page splash - with photographs and a story about the strike. The newspaper listed all the different classes of workers who had been out on strike in Hull during that hot summer - cement workers - factory girls - seamen and dockers, and connected the children's strike to them. It was a photograph that really affected me - it was a picture of the children picketting the gates of Courtney Street Primary School, the same school I had been to myself. I identified myself with those strikers - some of them might have been the parents of the children I went to school with. When I looked at the Times I found that children's strikes were taking place not only in Yorkshire but all over the country. At first I couldn't believe it - how could it have taken place so quickly and all over the country - I'd always believed that strikes were something which had to be organised. I felt that these children were trying to say something. I did not realise how many places were affected until I started reading through the local newspapers at Colindale. These showed that there were many more than the Times had reported. At Colindale I came up against my first real difficulty. Many of the local newspapers for 1911 were destroyed during the Blitz. When I looked up the catalogue I kept coming upon complete runs of different local newspapers with a note saying "Missing 1911". 1911 seems to be the only year to have suffered so badly. But even from the newspapers that were left it was possible to piece together the geography of the strikes because they contained not only reports of local strikes but also referred to ones taking place elsewhere. For example Newcastle-under-Lyne paper would tell me that strikes had taken place in other parts of the country. Some of the reports speak of hundreds of children parading through the streets and at Dundee and Hull thousands of pupils defied the school authorities, but it is not possible to give the actual numbers of children who left their classrooms. The list of places is also not complete; only by visiting every town in the country and seeing if a 1911 newspaper survives in the local newspaper office or library could I have got a complete list. But even without a complete list it is still possible to draw certain conclusions. My own recollection of life in the classroom is that children did not support each other when they saw a classmate victimised by the teacher. A schoolboy would stand there, defenceless in front of the teacher and accept his punishment with- out question or protest and nobody would come to his aid. Whereas in the case of the dockers, you only have to hear of someone being victimised and you would give your support to any action taken on his behalf. When a situation demands strike action the dockers working a ship,simply leave everything and walk off. The men then walk around the docks bringing out dockers from other vessels. The formula is: we've never got anything except by sticking together; let's keep it that way. On the docks most men know each other personally because they have lived out of each other's pantry. The term 'Brother' is a union term, but on the docks it really means something; it could be your brother. In the docks it is like a family born out of experience of hardship and trials knowing that the other man is in exactly the same position as you are; if it happens to him, then sure enough it is going to happen to you. Apart from that it's. just a feeling. Even the old dockers could not explain it; people would stand up at the strike meetings and speak - opening their hearts to the men, and others would follow them, because they knew they were speaking the truth. When somebody shouted down the hatchway, "We're all out" you would stop work immediately. It was a duty rather than a matter of pride or anything. The financial needs of your family came second when you voted to strike. Dockers are used to taking risks. In my school when a teacher was disciplining a boy in the class, he would first of all make the boy a laughing stock, make him appear stupid. The teacher got you on your own. He picked on one child and not the group. An example I remember went like this; a boy had been fiddling about under his desk for most of the lesson when the teacher became very annoyed and finally ordered him out to the front and made him bend over; as he reached for his cane, the boy bent over and the split in his trousers (which he had been trying to hide from the class) opened out and we all saw what he got for his birthday). The class fell about laughing. The teacher made him sit down and said that he had been punished enough. Whenever there was punishment we accepted it. Perhaps the teacher would pull the boy out in front of the class and try to make him explain his misbehaviour. You were made a public exhibition; probably your friends would laugh at you for being caught out. The teachers were able to make use of these situations; they always made sure the class was laughing at the individual who was being punished. We went out of our way to test the teacher's strength. If he was a new teacher we would get cane off him, because we would try and assess his authority. We tried to make him lose his temper. Student teachers were our favourites. The boys in the class acted dumb or stupid: whenever they were asked a question our answer was 'Huh'. I think we knew that a teacher could lay the stick on us or even thump us but he could not thump any harder than our parents. If your Dad happened to be a docker for instance, he could bloody well throw a punch and make it hurt. A Pappy teacher with nice soft hands was not in the same league. That was a kind of caring. I can remember lads dozing off in class. They just did not want to study. They were not tired, they simply did not want to do anything. Some teachers let these lads sleep on thinking the boy needed the rest. Children in a classroom are looking for something. In a class of 40 you feel you have to draw attention to yourself; you want the teacher to take an interest in you. The teacher is part of the child's life, he is there in front of the child. On the docks it is different. The employer appears now and again; most of the time a workman is on his own. You are not interested in what he thinks about you personally, he may never have seen you. When children act against the teacher they do not make a stand together. When one of them is caught out they do not back him up. During my school days we never walked out as a body. Individuals ran out and brought their parents back. usually Mam; some would threaten the teacher by saying "I’ll fetch me Dad." The class would then sit back and await the ensuing slanging match, usually making derogatory remarks about the teacher's lack of manhood. I think we looked upon these situations as entertainment. Hull escapes little in the way of trouble, and so it came to pass yesterday that hundreds of schoolboys came out on strike. Hull has thus been involved in practically every phase of unrest which has troubled the country during the past few months. For weeks there has been a feeling of anxiety as to what might happen next. First, the sailors and dockers; then the millers, cement workers, timber workers, railway men, news-boys, factory girls and now the school-boys. The strike started at the St. Mary's Roman Catholic School. when twelve of the older boys led the younger boys out of the playground during the morning break. Once it was known they were. on strike, the news quickly spread around the school, and by the time the afternoon lessons should have started the strike news had reached several other schools in the East End of Hull. Soon there were crowds of boys standing outside their respective school gates; howling and shouting 'come out!' and 'blacklegs', at the pupils who were returning to their classrooms. Lively scenes were witnessed outside St. Charles Roman Catholic School in Pryme Street, about half-past one. Some of the older boys held meetings, and the manner in which they aped the leaders in the recent strikes was significant. 'There is too much work,' said one lad, and immediately there was a shout of approval. 'And too much cane,' said another, whereat there was a louder shout. Hats were waved, and then a policeman came on the scene, and some of the younger boys wisely ran into school. But not so the older boys. They ran off in various directions. A crowd of lads made themselves very objectionable outside St. Mark's School. The vicar (The Rev. Butler Cholmeley), whose house is near the school, tried to calm the excitement of the boys, but stones were thrown and he was hit on the forehead. An endeavour was made to raid the school, but it did not meet with success. A large number of parents had gathered, and the boys made a hasty retreat. Before going, however, they let it be known that they demanded the abolition of the cane. At some of the schools, windows were broken.2 The lads visited more schools, Buckingham street, Escourt street, Craven street, Mersey street and soon they were joined by children from Lincoln street, and Courtney street. ,Outside the Charter House school, a policeman mounted on his bicycle made several charges at the boys before they ran away. Thousands of people lined the main road to watch the progress of the strikers. Tradesmen were out at their doors, laughing at the unusual scenes, although many were making anxious inquiries as to the whereabouts of their errand boys. The newspaper reported on all this in a very sarcastic manner, an attitude repeated by papers throughout the country; not in one single report or editorial does the children's unrest motivate a serious inquiry. The strike now spread to the Manchester area; here again the boys came out because a boy had been punished for a minor offence. The young disputants desiring to extend the fight against the powers at once appointed pickets who, labelled with papers pinned to their caps bearing the word 'picket', marched in a body to the Holland street Municipal School which is close by, the object being to induce the scholars there to declare a sympathetic strike. These endeavours, however, were futile, and the presence of the teachers at the gates prevented the pickets from entering the school grounds to carry out their programme of 'peaceful' persuasion. The strikers next proceeded to the school of Corpus Christi, in Varley Street. By this time they had assumed quite a militant attitude, having on the way secured sticks which they brandished fiercely, but an even more terrifying display was made by others who were the possessors of toy pistols. By the middle of September, the schoolboys' strikes had reached as far south as Portsmouth and, Southampton, while in the North and Scotland schools in Glasgow and Leith were affected. Throughout the country schoolboys had taken to demonstrating in the streets. No one would listen to their demands, they were laughed at and ridiculed by grown-up onlookers. These same children had just returned from the school holidays and although their strike action failed to shut down any one school completely they were able to create disturbances serious. enough for the police to be stationed at school gate. Their efforts were sufficiently newsworthy for their endeavours to be recorded for posterity in those newspapers that normally only gave them space in poetry and puzzle 'corners'. Throughout the country, 'Rolling Columns' and 'Flying Pickets' of children, seemingly without any organisation, managed to create disturbances serious enough to warrant police and in some cases plainclothes men being called out to restrain them. Even the very little ones were affected by the strike epidemic. There is a report that strikers at Risinghill School , Islington, included children as young as three. 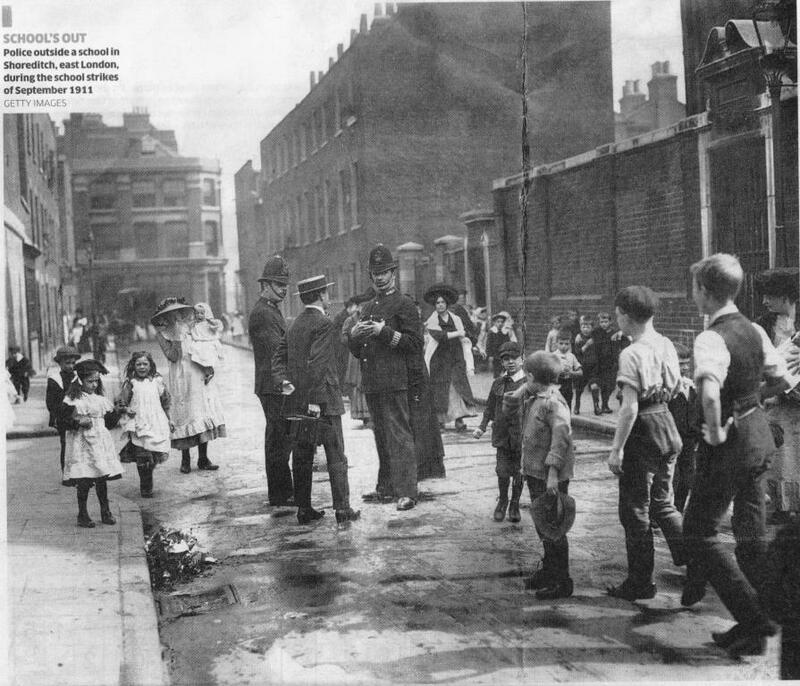 And at Tower Bridge Police court, 'two tiny tots aged six and eight' were brought before the magistrate on September 15th. They were both named Tillyer and were from Bermondsey. They were charged with wandering abroad without proper guardianship. … when the school children in the Edgehill district of Liverpool were released for playtime they went on 'strike', parading the district and calling upon other schools asking the scholars to come out in sympathy. Window panes and street lamps along the line of march were smashed14 and the loyal scholars' were beaten with sticks. The boys carried banners, shouted slogans, and chalked their demands throughout the country. What were they demanding? It could be that some boys preferred to picket outside schools other than their own because they did not want to be recognised as strikers by their teachers; equally conflicts existed between boys at different schools and they may have seized the opportunity to continue old or recent conflicts which would account for some of the reported fighting between groups of boys. There were other punishments for these children, because black marks would go on their character references, which were needed when applying for a job: for some it meant giving up their chance to win an attendance medal for which many respectable working class parents coveted - so much so that some children were forced to go to school even when they were ill. It took four years of perfect school attendances to win a bronze medal, six years for a silver, and ten years to achieve a gold. The strikers were particularly formidable in Shoreditch, East London, making heavy raids 'armed with sticks, stones, iron bars and belts'. They 'breathed sufficient fire and slaughter to cause a dozen police to be specially called out.49 Police were also out in force in Liverpool. News of pickets arriving at schools brought teachers and parents alike to the gates to protect their children. In Hull, troubled parents were rushing to the schools to see if their boys - the strike was confined to boys - had turned up for lessons. At Llanelly the headmasters 'got wind of the mischief that was brewing' and when the flying pickets, who came from the Copper Works and Old-road schools, arrived, they were 'ignominiously driven away', says a report in the Western Weekly Mercury.54 At Grimsby some boys from the Weelsby-street School paraded the town with poles bearing streamers and the words 'Schoolboys on Strike'. The strikers marched to two other schools 'but the teachers having been warned… kept their boys in school. The most active strike-breakers, in many places, seem to have been the mothers. Not only did they exert pressure on the children when they returned home, at the end of the first day's strike, but in some cases they intervened more actively, dragging the children back to school on the following day, and in a few cases mounting a counter-picket at the school gates. For instance an attempted strike at East Wall National School, Dublin was suppressed summarily by the mothers, who gathered in force, armed with all sorts of weapons, and cleared the malcontents off. The boys may have had some sympathy from their fathers who understood their feelings but they never interfered when it came to school matters. It was the mothers again in London who acted as strike breakers. 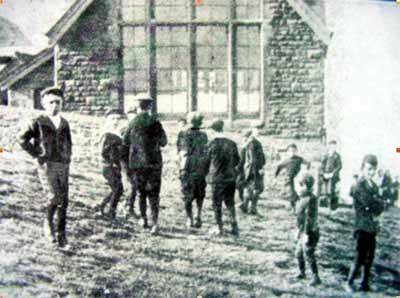 Children in the Southampton districts were also brought back to school by their mothers. Girls, because they were more closely controlled by their mothers than boys, played a very small part in the strikes. Only two reports mention them. At Portsmouth 'about 150 boys and girls from two council schools paraded the streets and went round to other schools seeking for recruits.62 And in Scotland the school girls in Kirkcaldy and Cambuslang showed themselves to be far more militant than the girls attending schools in England and Wales. It could be argued that the Scottish educational system was far more equal in that it encouraged the girls as well as the boys in obtaining educational standards. One of the teachers laid the blame for the 'strike' at the door of a few boys who have recently left school and gone to work. Rejoicing in their own newly-won freedom from the irksome discipline of school, it is believed that these young toilers were filled with the glorious hope of making less hard the lot of their former schoolmates66 who were still bound to dull drudgery at the desk. EIGHT SCHOOLS INVOLVED IN DUNDEE. A HUNDRED SCHOOL WINDOWS SMASHED. Rowdy scenes occurred in Dundee yesterday in connection with a strike of schoolboys. No fewer than eight schools were involved, and it was calculated that by the afternoon several thousand boys had mutinied. The trouble arose originally in Cowgate School, where there was a breakaway in the morning, and the leaders of the movement were observed to threaten others if they did not join. The masters, interviewed, stated that they were unaware of any grievance, while the boys declared that they wanted to be given fewer home lessons, more holidays, and less of the strap. At eleven o'clock the trouble seemed to be disappearing, a large section of the lads returning, and one of the leaders, who was subjected to corporal punishment, refused to advise a continuance. But the news of the strike had got abroad in the town, and at the dinner hour there were defections from Wallace town, Victoria Road, Blackness, Balfour Street, Hill Street, and Ann Street schools, and the boys paraded through the town and adopted various tactics to secure accessions to their ranks. A company of them paid a visit to the High School, and, armed with sticks and missiles, they created a demonstration. They did not, however, succeed in getting any recruits at this institution. In many instances the parents of the boys interfered with a view to putting an end to the dispute, and one boy was driven back to school by his grandmother, who boxed his ears from time to time. No girls took part in the demonstrations. In textile towns like Dundee school and factory-floor were not so far apart because of the system of 'Half Timers'. Bob Stewart in his autobiography, Breaking the Fetters, tells of the infamous social and industrial character of Dundee. The jute mill-owners were the biggest single employers of children between the ages of 10 and 14 years and, as they were required by law to educate the children, some classrooms were actually built in to the mills. Schools and homes were built among the warehouses and jute mills for immigrant workers; the majority coming from Ireland who were considered to be the lowest form of life by the rest of the community. Jute in its raw state is obnoxious and dangerous to health, particularly where workers breathed and swallowed 'stour' (flakes of jute) into their Iungs and stomachs , giving them a permanent thirst, which is perhaps why Dundee was considered to be a town of drunkards. 'Half Timers' worked for three days a week in the jute mill then spent two days at school. The next week vice versa. On Saturdays they worked till 2 p.m. Pay for a short week's work was 2s.9d and a long week's 3s.4d. Oh dear me, the mull's work gaein' fest Puir wee shifters canna get a rest, Shifting bobbins coarse and fine Who wad work for twa and nine. It was during the meal breaks that the children became involved with the grown-ups' world, the noisy machinery stopped, while its operators gathered in small groups; conversation would be at a minimum until they had finished their sparse meal (no doubt the luckier ones shared their food with the children); then the children would contribute by reading from newspapers and journals. Perhaps, while passing on the latest news to older workers, they discovered how other children throughout the country were struggling to make their plight known. 'Groves' was always a very poor area, and in fact it was an area well known for moonlighting. 'Broken' homes were common. There was a definite housing shortage because a lot of people were coming in from the land; out of work country labourers coming into town and putting up in lodgings. The men could either get beer on the slate or they could get a job; an hour's work to buy their beer enabling them to sit in a public house for a night. Their children, while they still attended school had part-time jobs, the boys did errands for shopkeepers or newspaper selling. They would help a grown-up - perhaps their granddad or uncle who owned a stand at a street corner. One old timer remembers working for a butcher, starting at six of a morning before going to school then working for him again at night time: sometimes he would not finish until after ten o'clock. His pay was half-a-crown a week and 'bits' (these were pieces of left-over meat). The children's lives were very mixed up with the adults - the entire family often slept in a single room and the children slept where they fell asleep with exhaustion. Bed-time came just before the old man came home from the pub. Charlie Simpson can remember waiting outside the pub for his father so he could help him home. When he got his first job at the paint factory, his father, a docker, would wait outside for him on pay-days and take his money from him so he could go into the pub. Another old lad remembers he never got the yellow part of an egg until he was eighteen. His Dad would slice the egg top off and give him it, and that was his breakfast, or he had to dip a slice of bread in the frying-pan after his Dad's bacon had fried. From the photographs taken during the strike you get a good idea of the children's physical appearance. They were very thin, their eyes bulged, and they all seem to have bags underneath their eyes. Some of them had no shoes. In some cases, boys had no shoes but wore a collar and tie. In the summer-time, their thicker clothes were stored away or pawned. They were generally pawned because they were safer there. Bob Broadwell, a retired docker, recalls how he and his brother had to stay off school because they didn't have any shoes or clogs to wear. We had clothes cos some of the lads in the class would bring us things to wear. The Headmaster sent a note round to our house for us to take to 'Cloggy Walsh's'; when we got our clogs they was marked with a circle on the toe-cap so me Mam couldn't pawn them. Most of the children went around bare-footed during the good weather, their clogs and shoes would be cleaned and greased and then stored away probably until the month of November. The school authorities did not stipulate that footwear had to be worn. When these children entered the school they were marked down as being different from the rest of the pupils by the teachers' attitudes towards them - to the way they dressed and to their general appearance. Most of these children were suffering from all the children's ailments. 'Nits' in the hair was the most common one that straight away marked them down as something different because they had their heads shaved. When I asked Bob Broadwell about his appearance while he was still at school, the first thing he said was 'hair-cuts'. He said they could not afford to go to the barber's shop. His parents would place a mixing bowl on his head - this gave a straight edge to cut to - if the basin did not fit tight there would be lots of steps left, and after numerous attempts to keep a straight line he would be left with a small quiff at the front of his head. In cases of nits the school authorities would insist that the children's heads were shaved. Poorer children lived in cramped homes and if it was a large family, they probably slept in the same bed, so if anyone of the family had any kind of head infection all the family would soon be infected. School would begin in the morning with an inspection. This normally took place in the school play-ground. The children would assemble in their classes and the teacher would walk along the ranks inspecting the children thoroughly. The children would stand with their hands out-stretched to have their finger-nails inspected. Normally the teacher would signal the children to turn their hands over by tapping their hands. After a while the children would begin to do it automatically. At these inspections children would have to bend their heads and turn them from one side to the other, allowing the teacher to inspect their necks and heads. One boy was found to have a 'tide-mark' where he had only washed the front of his face leaving his neck dirty. The teacher dragged him out of the line and called him a 'parasite', then sent him off home to be washed. Teachers would inspect the children as if they were some kind of animal or piece of furniture at a sale. This kind of treatment started first thing in the morning as they entered the schoolyard and continued until school finished. Harry Burns remembers when he was a school boy, he was always singled out because his family was very poor. It was left to the teacher to notice if a child required special attention. For example, if a child needed shoes or clothing and free meals, the teacher would inform the headmaster. Then it was his decision whether or not the child received help. When children got clothes from the school authorities they were specially marked to stop them being pawned. Those children who received free meals had to go to the nearest coffee-shop; not a place where table cloths were used and waitresses served. A working man's coffee-shop, where he went for his break time from work. The boys and girls had to sit among people who would be smoking and spitting on the floor, a generally rundown place. The children received their breakfast, dinner and tea if the Headmaster thought they needed it. A book was kept by the coffee-shop owner which the child had to sign after every meal. This book was shown to the headmaster once a week and any child who had missed a meal was punished. The teachers treated the poor kids as the dumbest pupils in the class. They usually ended up sitting in the very front desks. That was so they could keep an eye on them because if any trouble started in the class, it was usually the poorer children who started it: simply because they could not concentrate. The children had no discipline when they were reading and writing and when they got bored they would start talking amongst themselves. The teacher would walk across and hit them with whatever he had in his hands at the time or threw things, as the best way of dealing with any insurrections. Harry Burns can remember the chalk missiles coming thick and fast at times because they could reach him quicker than the teacher could cross over to him. The teacher made him into a joke: the boy who had chalk thrown at him was the 'Aunt Sally.' Can you imagine a boy with a shaved head having chalk thrown at him? It was a derisive situation for the boy and the other children would laugh at him. Harry told me that the poor boys were always second in line if there was anything to be passed around, for example in Nature Study lessons, boards of moth and butterfly collections were given to monitors to be passed around the class and of course they would not pick one of these lads as a monitor. Another way in which the poorer lads were singled out was in the school's sporting activities. They did not have the proper sports equipment and the school could not provide them with football boots or swimming costumes. When the children went to the swimming baths these lads went 'Bare Golly'. When it came to the time for the school's swimming gala or organised sports day, boys who did not have the right equipment could not take part. In one of the photographs taken of the Hull children's strike of 1911 you can see the children in 'Bare Golly'. Some of the children went to the river bank for a swim and the photograph shows the boys standing in groups, some with costumes but the majority naked. Colin Hedge, a retired joiner, remembers he lived in the most densely populated street in Hull 'it had fifty-two terraces, each containing twelve houses. There were two pubs, a church and a Church Army recreation home, a bake-house, a barber' s shop a grocer's shop and a butcher's and a school.' His school was divided into three, 'infants', 'girls' and 'boys'. 'It was made obvious they didn't want us to mix because high brick walls separated the play-yards.' He has not forgotten the inspections, 'We were all frightened when the "Nitty Nurse" came to inspect our heads.' Children who had 'general labourers' for fathers were the poorest, every day they would collect a free soup ticket from the teacher's desk then rush off to the soup kitchens on Hessle Road. Colin was the leader of a gang named the 'Black Hand Gang' whose initiation test was to climb up on to the school roof and drop paper bags filled with water from a milk-bottle, down on to a character named drunken Jesus as he staggered back to the Church Army home. Albert Green - a tally clerk, now in his sixties - remembers how his father shaved the boys' heads, a prevention against 'head nits’ leaving only a pony to hang down on their foreheads. Once my Mam made me go to school bare-footed in wintertime so I would get some boots from the Public Benefit. The boots had holes in the uppers to prevent our parents pawning them, but she would fill them with boot-blacking. My only other clothes were a woollen jersey and a pair of trousers, usually handed down from my older brothers. Sometimes me Mam worked in the Egg Packing Ware- house in St. James Street, we always had plenty of eggs to eat then. Her job was to hold the eggs in front of a candle, looking to see if they were bad or not. Before she went off to work she'd lift her clothes up and push a bag underneath ready to slip the eggs in when she had a chance. Most of the women were pregnant so no one would notice another bump. We always went begging after school closed and the factories were leaving, the paint factory was nearest. 'Got any bread left over from their packing-up’. One day a bloke gave me a sandwich he had plastered thick with mustard. My mouth was sore for days after. Soon after that a policeman caught my brother and me begging and we were sent to industrial schools in different parts of the country and we have never seen each other since then. The immediate background to the children's strikes was the industrial unrest which had been breaking out all over the country in the months beforehand. The summer of 1911 came in a blazing fury which was to give men thoughts of .other things, as the bright sun entered their damp-dark communities. It was the seamen and firemen at Southampton who sent the first red-signal rockets high in the clear June night skies. The red glares announced the men's willingness to fight for more wages and better conditions. The strike spread rapidly to other ports, Goole, Hull and Liverpool were soon at a standstill. In Hull, the unrest broke out with a seamen’s strike with the dockers joining in (they had not forgotten the way in which the seamen had supported them in 1893). The dockers in Hull had been completely at the mercy of the dock employers. There was a mass of labourers; ,,,when they reported for work they were simply chosen by someone calling out, 'you, you and you:' The most casual were the "summer dockers", as they were called (my father was one). It was a derisive term for men who spent the winter working in the seed-crushing mills. In the summertime they joined the 'Gangway Enders' on the docks. They just went from one ship’s gangway end to another hoping to be "set on". In one period there were seven thousand casual labourers seeking work on the Hull docks; even in busy boom times there was only enough work for approximately four thousand men. The dockers had had little or no organisation since their union had been smashed after the 1893 dock strikes. But now in 1911 a new leadership had emerged, younger men, eager and willing to fight and organise strikes with other sections of the transport industry. They began to realise how effective they were in such groups, but also they were becoming very individualistic. Dockers began to earn a reputation for being tough and militant. They were not just drab figures in the misty mornings on the dock-side. Their brothers in other ports had beaten the Shipping Federation, now it was their turn. They were not just beasts of burden, now they were demanding better conditions and better amenities. It was an awakening for the working man. Once the strike had started in Hull it spread to every class of waterfront labour, the lightermen, mill workers, deal carriers, fishdock workers and men who worked in the saw-mills. Policemen were drafted in from Birmingham, Leeds and five hundred of the Metropolitan force to control crowds of strikers who besieged factories in an attempt to involve every working man and woman in the struggle for better conditions and higher wages. Monday and Tuesday at Hull were days of comparative calm, the strikers chiefly concerned themselves with attending mass meetings and strengthening their picketting arrangements. But with Wednesday came a serious and ominous turn in the affair. The strikers in large bodies visited various works and mills, and in most cases succeeded in bringing the workers out. The women in Hull have often been prominent in strikes. I think if it were not for the women of Hull there would not have been as much change as there has been. The women always insisted their menfolk should come out on strike, whatever the reason. One old woman said, 'If he hadn't come out on strike, I'd have licked him!' She was talking about her husband. The industrial unrest died down in July, but a second wave of it broke out in August. It was the hottest summer on record. The temperature reached 110° in some places. As in June, the strikes affected every industry. For instance at Manchester no fewer than eighteen trade unions pledged, 'No return till all were satisfied:' By the middle of August the unrest had spread to the railwaymen, whose lower paid grades revolted against the years of trade union respectability and forced the executives of the railwaymen's societies to call their first national strike. Transport workers of all kinds joined in - the carters, river boatmen and bus conductors - drawing strength from a movement representing the unskilled and unorganised. At Hull, the schools most affected by the children's strikes were in the East End of town - where the strikes of June and July had been most general. The children on strike were consciously imitating - or learning from - their elders. The way I see it is, the children must have been listening at home to all the talk about strikes, all through the hot summer of 1911. Then suddenly, they were presented with the chance of striking themselves, their pent-up feelings about school collectively with their mates. As the strike spread from town to town around the country the children began to organise them- selves, using pickets and mass meetings, like their elders, and attacking non-participants as 'blacklegs' and 'scabs'. They had seen the street demonstrations and obviously saw this as a way of expressing themselves. There was no authority to stop them marching about the streets carrying placards. They were quite jovial about it. The children may not have realised the seriousness of it when they saw their fathers carrying banners which had cost more than the men carrying them could earn in maybe two or three years. After I had finished the research at Colindale I got the impression that something was missing from the newspaper reports. It is difficult to imagine or reconstruct how these children fared during lessons. The majority came from poor households and were described simply as the 'truant classes', or children from the 'lower' parts of the town. Their lessons consisted of hours spent in monotonous repetitive chanting of numerical tables and verse. Individuality was repressed by unimaginative teachers who obviously treated the children as lesser beings simply because of their social backgrounds. The strike was a vehicle by which they expressed their feelings in an energetic physical way, how else? Perhaps at the time it seemed that strikes could carry all before them, and only in the event did they learn how difficult a thing it was to support. How did the children come out of it? A few hours' freedom doing exactly what they wanted to do? Seeking sensations? The photographs show happy smiling faces and obvious signs that they are enjoying themselves whatever the consequences they would suffer on their return to school. Although the newspapers are prejudiced in their reports they did give factual reports describing the children's behaviour during the demonstrations and some of these are pretty remarkable. In the industrial areas, children used chalkwriting on the pavements and walls around the school to proclaim their grievances. They used more direct forms of agitation when other pupils refused to come out in support. In extreme cases 'loyal scholars' were beaten with sticks and police were called in to protect school property. Teachers were handed leaflets demanding no more cane. At Bray, Co. Wicklow, the teachers received an ultimatum demanding fewer school hours and more playtime. When this was refused the boys left the school and paraded the streets, singing to the accompaniment of tin whistles and mouth organs with snatches of 'Tramp, Tramp, the boys are marching' and 'Fall in and follow me' (the favourite strike song all over the country).85 The children's attitudes towards the school authorities in various parts of the country differed from complete surrender on the headmaster's appearance to the stoning and harrassing of anyone who remotely looked like representing authority and discipline. Away from their classrooms the jubilant children began to express themselves in various ways. To some it would be a 'street theatre' and to others the sheer feeling of freedom would exhilarate them enough to address the crowds of boys in the manner of the factory-gate or street-corner agitator. To the newspaper columnists they were 'Dunces'; 'The Truant Class'; 'Children from the Poorer Areas'. This attitude shows how the respectable classes regarded them. Throughout the country children began to show originality and independence. The strikes were not all violent. In Hartlepool the boys walked along the sands and picnicked, taking advantage of the splendid late Summer weather. In other places they went swimming or simply sat around discussing general topics; they played at being soldiers and paraded; some sang patriotic songs. In Northampton strikers went blackberrying. But more important they entertained themselves with their own music making up the words to songs. These children, despite their stifling schooling showed their minds had not been overwhelmed by the gray monotonies of the class-room. They still retained imagination with ideas like the colours in a paint-box. Published by History Workshop in 1973. 1. Hull Daily News -12 Sept. 1911. 2. Ibid., 13 Sept. 1911. 3. Hull Daily News - 12 Sept. 1911. 4. Western Weekly Mercury 9 Sept. 1911. 5. Llanelly Mercury 7 Sept. 1911. 6. Llanelly Mercury- 7 Sept. 1911. 7. Northern Daily Mail 9 Sept. 1911. 8. Northern Daily Telegraph 9 Sept. 1911. 9. Northern Daily Telegraph - 9 Sept. 1911. 10. Birmingham Daily Mail 14 Sept. 1911. 11. Northern Daily Telegraph, 13 Sept. 1911. 12. Hull Daily News, 16 Sept. 1911. 13. South Wales Daily Post, 12 Sept. 1911. 14. School Government Chronicle, 16 Sept. 1911. 15. The Greenock Telegraph, 19 Sept. 1911. 16. Northern Daily Mail, 15 Sept. 1911. 17. The Illustrated Chroniale, 15 Sept. 1911. 18. The Times, 13 Sept. 1911. 19. Northern Daily Telegraph 15 Sept. 1911. 20. The Star, London, 12 Sept. 1911. 21. Birmingham Daily Mail, 13 Sept. 1911. 22. The Weekly.Express, 15 Sept. 1911. 23. Northern Daily Mail, 15 Sept. 1911. 24. Ibid., 12 Sept. 1911. 25. Birmingham Daily Mail, 13 Sept. 1911. 26. Paisley Daily Press 15 Sept. 1911. 28. The Greenock Telegraph 16 Sept. 1911. 29. Lancashire Daily Post" 14 Sept. 1911. 30. Northern Daily Mail 14 Sept. 1911. 31. Ibid." 16 Sept. 1911. 32. South Wales Daily Post 7 Sept. 1911. 34. Birmingham Daily Mail 14 Sept. 1911. 35. Grimsby and County Times 8 Sept. 1911. 36. Northern Daily Mail, 14 Sept. 1911. 37. Northern Daily Telegraph, 13 Sept. 1911. 38. The Lancashire Daily Post, 13 Sept. 1911. 39. Birmingham Daily Mail, 13 Sept. 1911. 40. The Times, 14 Sept. 1911. 41. The Greenock Telegraph, 15 Sept. 1911. 43. The Observer, 15 Sept. 1911. 44. The Leicester Mail, 14 Sept. 1911. 45. The Evening Reporter, 13 Sept. 1911. 46. The Herald, 13 Sept. 1911. 47. The Times, 14 Sept. 1911. 48. The Lancashire Daily Post, 15 Sept. 1911. 50. Northern Daily Telegraph" 12 Sept. 1911. 51. The Liverpool Daily Post and Mercury 14 Sept. 1911. 52. The Times 15 Sept. 1911. 53. Bull Daily News 12 Sept. 1911. 54. Western Weekly Mercury 9 Sept. 1911. 56. The Irish Times 15 Sept. 1911. 57. The Illustrated Chronicle 13 Sept. 1911. 58. The Independent 15 Sept. 1911. 59. Northern Daily Telegraph 13 Sept. 1911. 60. Hull Daily News 13 Sept. 1911. 61. The Hampshire Advertiser 16 Sept. 1911. 62. The Times 15 Sept. 1911. 63. The Greenock Telegraph 16 Sept. 1911. 64. The Times 14 Sept. 1911. 65. Biringham Daily Mail, 14 Sept. 1911. 66. The Irish Times 15 Sept. 1911. 67. The Weekly Express 15 Sept. 1911. 68. The Hampshire Advertiser 16 Sept. 1911. 69. Paisley Daily Express, 15 Sept. 1911. 70. Bob Stewart, Breaking the Fetters, London, 1967 p.13. 72. L.K. Phillips, The Ragged Edge, p.70. 73. Hull Daily News 13 Sept. 1911. 75. The Times 13 Sept. 1911. 76. Liverpool Daily Post 14 Sept. 1911. 77. L.K. Phillips, The Ragged Edge3 p.7. 78. The Daily Mail 1 July 1911. 79. G.R. Askwith, Industrial Problems and Disputes London, 19 20, P .150 . 81. George Dangerfield, The Strange Death of Liberal England 1910 -1914, London, 1961 ed., p.269. 82. The Illustrated Chronicle, 15 Sept. 1911. 83. Greenock Telegraph, 15 Sept. 1911. 84. The Herald, 16 Sept. 1911. 85. Northern Daily Telegraph, 20 Sept. 1911.